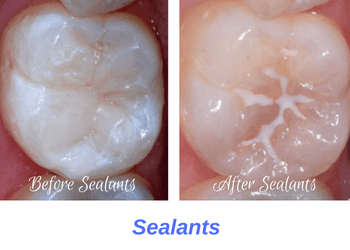 What is a sealant procedure like? What are the benefits of placing sealants on baby teeth? Are there any risks with placing dental sealants on teeth? Dental sealants in San Clemente, Orange County. We typically place sealants on baby molar teeth which have deep groves. Dental sealants are tooth-colored, plastic coatings which are placed on children’s teeth to protect them against cavities. 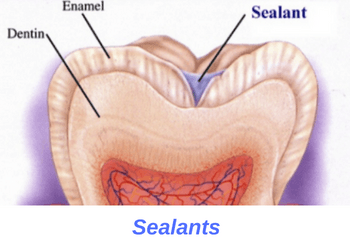 Sealants look like small white filling and seal off access to the inner tooth structure. We typically place sealants on baby molar teeth which have deep groves. 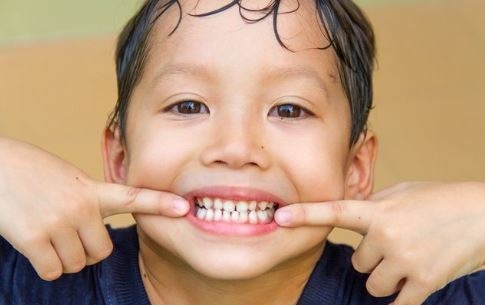 These teeth are susceptible to developing cavities especially because it’s hard for children to reach back there to clean these teeth. Sealants are an effective preventive treatment as they have been proven both safe and effective. Most sealants take 5 to 10 minutes to place, but they help protect your teeth for the next several years. Placing a sealant is a very simple procedure, as easy as getting a dental cleaning. Unlike dental fillings, placing a sealant does not require any anesthesia or tooth structure removal. Sealants are applied and cured using a blue light which helps set the material. Most sealants take 5 to 10 minutes to place, but they help protect your teeth for the next several years. Typically, we place sealants for children on the furthest positioned teeth. 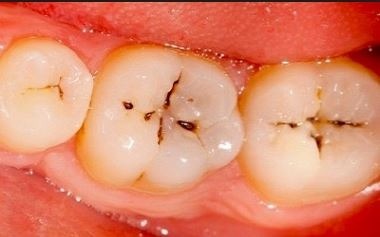 These molar teeth are the ones that children have the hardest time cleaning. We apply the first set of dental sealants at age 6 to 7 onto the molar teeth. A second set of sealant can also be applied at age 11 to 12 onto adult 2nd molar teeth. Some dentists only place sealants on adult molar while others recommend applying sealants onto baby teeth as well. Regardless, we highly recommend that you consider placing sealants on your children’s teeth to protect them. Deep groves on back teeth are very susceptible to developing cavities, especially in children. The main benefit of dental sealants is that they protect children’s teeth against cavities. Deep groves on back teeth are very susceptible to developing cavities, especially in children. The alternative to placing a sealant is to wait and see if the back teeth develop cavities. However, should these teeth develop cavities, you will now require a filling or possibly a root canal. Placing a sealant is much easier, quicker and more economical as compared to fillings and root canals. Plus, sealant appointments are virtually painless which can not be said of fillings and root canal procedures. Another advantage of placing dental sealants is that they create a positive dental experience for children. If your child’s first visit for invasive dental work involves needles and pain, this could lead to an everlasting fear of the dentist. On the other hand, a 15-minute pain-free sealant visit is an excellent way of introducing your child to the dentist. This help your child overcome his or her fear of the dentist and create a good relationship with their dentist. There are no risk whatsoever with placing dental sealants on your teeth. Placing sealants is a simple, easy and pain-free procedure. Plus, dental sealants are a fully reversible procedure since there is no tooth removal involved. This means that sealants do not harm teeth in any way. Most fillings stay on teeth and protect them for several years. By the time you’re an adult your sealant typically dissolves away, having served its purpose. We can place dental sealants to seal away those cavity bugs for good. If you’re interested in learning more about dental sealants, schedule your appointment with us today. Call us at (949)481-2540 or book your appointment online today. Our dentist, Dr. Jazayeri, will examine your child’s teeth to determine if he or she is a good candidate for dental sealants. If necessary, we can place their sealants right away to seal away those cavity bugs for good! So don’t wait for your child’s teeth to go bad, contact us today to see if we can help protect their teeth with dental sealants and other preventive treatments.